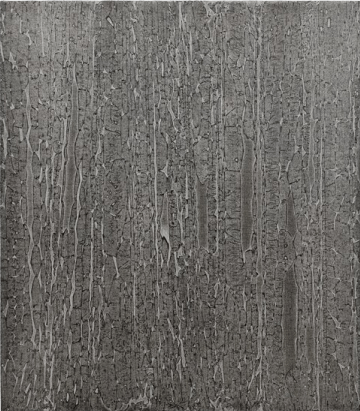 Philip Vanderhyden’s seven monochrome paintings in his solo exhibition, “Outside Group,” at Andrew Rafacz Gallery are primarily about materiality. Like silt in a stream, the paint in shades of gray washes down the canvas. Vanderhyden creates this effect by applying oil paint with rollers to burlap and creating textures in the wet surface by lying down and lifting up sheets of plastic wrap. Yet, matter is quickly transformed into matrix in these works. When viewed from a distance, the dense materiality of the paintings disappears and they seem as immaterial as the static on an old TV. This fluctuation between presence and absent is relative to changes in the viewer’s position within the gallery: as one steps closer, the materiality of the paint asserts itself and the “static” vanishes. In this shifting terrain, one can search for signs and patterns in the ebb and flow of the gray paint. Through March 19 at Andrew Rafacz Gallery, 835 West Washington.